Up to 1,500 Palestinians have been left homeless by the Israeli army's two-day raid into the Rafah refugee camp, the United Nations estimates. A senior UN official who went to assess damage said it looked like there had been a severe earthquake at the densely-populated camp in the south of the Gaza Strip, with up to 120 homes demolished. But an Israeli army spokesman put the damage at "several" buildings destroyed, with the military targeting only structures used by militants. Hospital officials said eight Palestinians - including two boys aged eight and 15 - were killed in the operation, which the Israeli army launched to destroy tunnels used to smuggle weapons across the Egyptian border. More than 50 were injured in the raid, codenamed Operation Root Canal, which was launched overnight on Thursday by dozens of Israeli troops backed by tanks and helicopter gunships. At least 40 Israeli tanks were seen withdrawing on Saturday evening from the camp, which is home to more than 70,000 people, often with several generations under one roof. "Many, many houses - maybe as many as 120 - have been completely demolished. They would have been the homes to 250, 300 families," said Peter Hansen, commissioner general of the UN Relief and Works Agency (Unrwa). "And if you multiply that by the family structure you're talking about a great many people, as many as 1,500, have been made homeless. His agency had yet to complete a definitive tally of the damage to property in the raid. Unrwa would be setting up temporary shelters for the homeless, he said. Dozens of residents could be seen trying salvage clothes, furniture and even school books by sifting amid the wreckage of their homes, the French news agency AFP said. "We could not escape. The house was like a jail for two days, but suddenly occupation forces entered our houses yesterday and told us to leave, " camp resident Ayman Abu Shannalah told the agency. "I refused but then they threatened to kill me with machineguns so my wife and her mother took me outside. In 30 minutes our houses was as flat as the land." An Israeli military official confirmed troops were pulling back, but said such operations would continue as long as the smuggling activities did. "Some forces are stepping out," he said. "But the activity is still ongoing, forces are still there and it will go on as long as the smuggling activity continues." 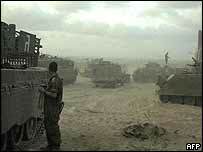 The Israeli army said it had discovered three tunnels in the camp, but no weapons have been found so far. Correspondents say the raid marks a change from previous Israeli tactics of launching brief incursions into Palestinian-controlled areas. Israel defended its actions saying it had intelligence that Palestinian militants were seeking to smuggle from Egypt shoulder-fired missiles that could be used against tanks, helicopters and fighter jets. "If we are successful ... blowing up most of [the tunnels], hopefully all of them, for some time at least they won't be used or there won't be any sort of smuggling of that sort," Israeli Government spokesman Zalman Shoval told the BBC's World Today programme. 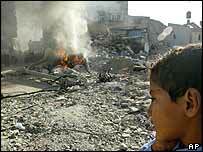 UN Secretary General Kofi Annan condemned the killing of Palestinian civilians during the incursion. "The Palestinian dead have included armed fighters"